This was an event organised by Richard O’ Brien on behalf of the Wallness Children’s Charity. It took place in Manchester. For the first time, the Way Out Club was asked to get involved in the event and arranged to organise a Drag Race in a Manchester shopping Centre. On the day of the ball, I was taking part in the race on behalf on the Boudoir. We met at the Boudoir on Friday afternoon, when the first mini crisis occurred. Jodie’s make up assistant failed to turn up, which meant that Jodie and Nas would be a lot busier on Saturday afternoon. The journey to Manchester was long, because we hit the rush hour traffic at Birmingham, but we were entertained on the way by the amazing Miss Tracie Ross, the woman of 1,000 voices. It was a shame they were all Welsh. Upon reaching Manchester, I teamed with my room-mate, but Jodie and Tracie had a shock on entering their room as the bed was occupied. After finally settling in we all met up in the bar and booked a meal at a local restaurant. Some of the girls elected to go out dressed, but I was in guy mode. It was only a short walk to the Italian restaurant and we had a very enjoyable meal followed by a few glasses of wine, before returning to the hotel where rather too many last drinks were taken prior to getting to bed at about 3am. As I was taking part in the race I had to be up and ready to be made up by 10am. With only a slight sore head I took the chair in Jodie’s room and immediately she went to work on my face while Nas started on the nails. As this was a Drag Race, the look Jodie went for was different to my usual look, with big eyebrows and lips, together with very long nails and wild hair, after which came the complicated part: trying to get dressed without smudging anything. We then set off to get to the race, and walking down the narrow corridors, I found it difficult not to hit the lights with the huge collar I was wearing. Myself, Jaynie, Kathy, Tracie, Nas and Jodie got in the lift and then the fun started: we got stuck in the lift! At first it was funny, but after a phone call to the hotel reception and a 10-minute wait without reply we began to get a bit worried. Jodie frantically called her father, who was already at the race venue, and asked them to delay the start until we got there. Finally, after 20 plus minutes, the lift began moving again, and I was then ushered into a cab for a breakneck drive across Manchester to get to the start. 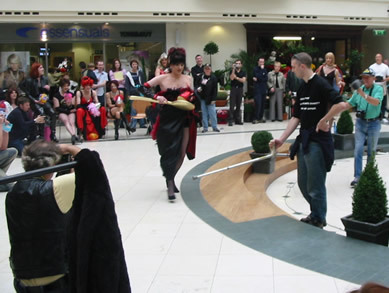 There were about a dozen other entrants in the race, which consisted of running/walking around the shopping centre, going in and out of two hoops, whilst carrying an egg on a spoon. The length of my skirt was so long and trailed on the ground, which meant I had to hold it in one hand and the egg and spoon in the other. The first managed to fall over twice on her run, and I was determined not to do that so I ran / walked / ran in what I was told was a ladylike manner. Unfortunately, this technique resulted in me not being the fastest around the course. This was achieved by Roseita, who was competing for The Way Out Club. 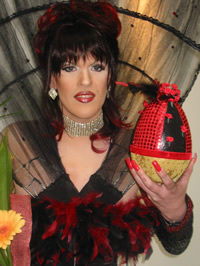 There were however three other prizes, Best Egg which was also won by Roseita, Best Outfit which I was honoured to win and also most money raised by the Charity, and thanks to help from all the girls at The Boudoir we also won that prize. After the race I felt like a film star posing for loads of pictures and even doing an interview for a forthcoming TV website. After my brief brush with fame, it was back into the taxi and on to the hotel, to get a quick shower and a bite to eat, before returning to Jodie’s room to get ready for the evening. Due to having to do about a dozen make overs, Jodie was unable to attend the race. She worked for 8 plus hours solid with her assistants Nas and Tracie, getting us all ready for the nights festivities. They were still working at 7.30 pm when they sent us down to the Champagne reception. After the reception it was onto the main hall, which was beautifully laid out. We had two tables to ourselves and by the time we had settled down to a three-course meal, Nas, Tracie and Jodie had arrived. Once the meal was over, the evening’s entertainment commenced, which started off with an auction, then a performance by the Way Out Girls, a Shirley Bassey look-alike, an Abba tribute and finally a disco. As the alcohol flowed, more and more of us hit the dance floor, until eventually there was a whole tribe of Boudoir Gurls on the dance floor. Festivities eventually ended about 2.30am, where we returned to the bar for one last drink, which became one more, then one more. I think I eventually got to bed about 3.30am, but some of the gurls stayed up until 5am. Next morning there were a few sore heads and I think Jodie and Nas were the last to appear for the 10am breakfast deadline, after which some of us left. Finally, the only ones who were left were the ones who travelled on the coach. The journey home was longer than expected due to traffic jams yet again and I think I got home about 7.30 pm just to see the Ryder Cup highlights. The whole weekend was brillant. Jodie, Nas and Tracie worked really hard all weekend and everyone had a great time; roll on next year.